Sifra is the earliest extant rabbinic commentary on the book of Leviticus. On a basic level, Sifra presents and validates rabbinic law, but this was done by creating a link between a proposition, halakhic or not, and a scriptural passage. Scholars in the last few decades—including Neusner and Stemberger—have debated Sifra’s relationship to Mishnah-Tosefta. Howard Apothaker demonstrates that the set of rules in Dibbura deSinai on topics shared with Mishnah-Tosefta can be understood as an independent body of law. They share a common ancestor but represent different expressions of a similar worldview and with variant purposes. The framers of Sifra sought as their main objective to validate the essentiality, or non-superfluity, of every word of Scripture. 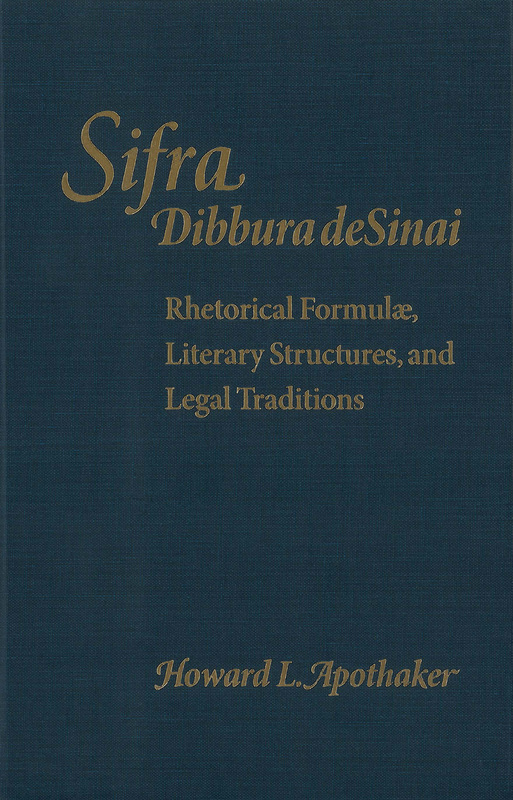 Apothaker’s analysis of the exegetical and rhetorical characteristics of Sifra in Sifra, Dibbura deSinai: Rhetorical Formulae, Literary Structures, and Legal Traditions builds on his translation of and commentary on the section of Dibbura deSinai which covers Leviticus 25–27. Analysis of Sifra’s highly formalized rhetoric yields insight concerning the general purpose(s) for which the framers created the work. Howard L. Apothaker earned his rabbinical ordination and Ph.D. in rabbinic literature at HUC-JIR, Cincinnati. He has served as Rabbi for Temple Beth Shalom of Columbus/New Albany, Ohio since 1980.